The past few months that I've had my Visor Platinum, I've filled it up almost to the brim with programs and information. 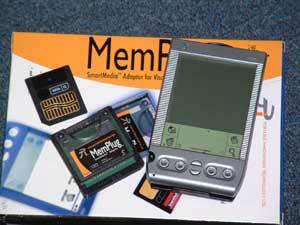 Even though 8 MB is a lot of memory for the Palm OS, there will be a point where it just isn't enough. With the increasing number of Palm OS programs and databases, you can run out of room fast. A number of options are available to increase the memory capacity of the Visor. They come in the form of Springboard modules that plug into the Visor providing either a set amount of memory expansion or a limitless amount through memory cards. If you're not familiar with the Handspring's Visor series of PDAs, they have a built in expansion slot called the Springboard slot. This slot gives the Visor infinite expansion possibilities. There are already numerous Springboard modules out there right now, from MP3 players to digital cameras. This expandability is what sets the Visor apart from all the other Palm based PDAs. Springboard modules are plug and play devices, meaning that they should have all the necessary software built into the module. All you need to do is plug it into the Visor and everything should be configured and ready for use. 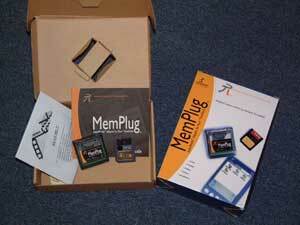 The MemPlug from Portable Innovations provides an unlimited amount of memory expansion using 3.3V SmartMediaTM cards. Unlike Handspring's own Flash memory module, the low cost SmartMediaTM cards provide pretty much a limitless supply of storage space. It also comes with software on the module itself that can transfer files, backup your visor data, view JPEG images, and view movies and animation. 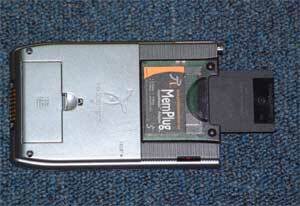 However, you can't run programs from the SmartMediaTM cards. 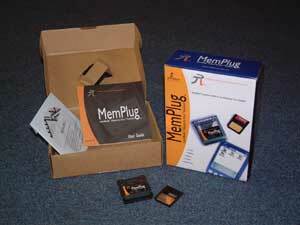 There are other solutions that use Compact Flash (CF) memory as their data storage, but those lack the true plug and play capabilities that the MemPlug offers. 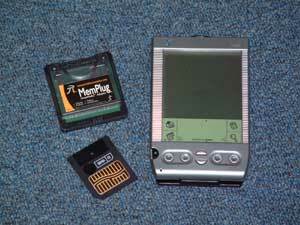 Portable Innovations was generous enough to provide us with a review unit and a 16MB SmartMediaTM card. If you're not familiar with SmartMediaTM cards, you can see them commonly used in Digital Camera storage, as well as other applications. They are very small and thin, as well as being cheaper than CF cards. Now let's take a look at what the MemPlug has to offer and if it really does enhance your Visor experience.